At least 53 people died when a packed passenger train derailed and overturned in Cameroon, the country's transport minister says. 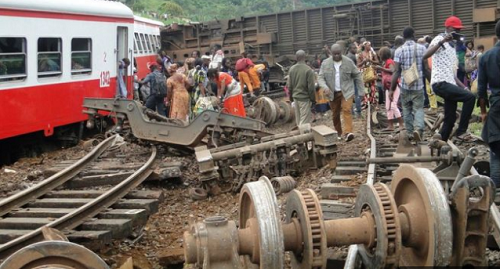 The train was travelling between the two biggest cities, Yaounde and Douala, when it overturned near Eseka. The Associated Press said there were 1,300 people on the train instead of the usual 600. The train was busier than usual as landslides caused by heavy rains have blocked roads across Cameroon. Transport minister Edgard Alain Mebe Ngo'o said some 300 people were also injured in the derailment, and that the death toll was likely to rise.